In my previous post, I showed the 9-patch unit for Block Y that needed to be re-stitched because my original 1/4" seams were too wide. 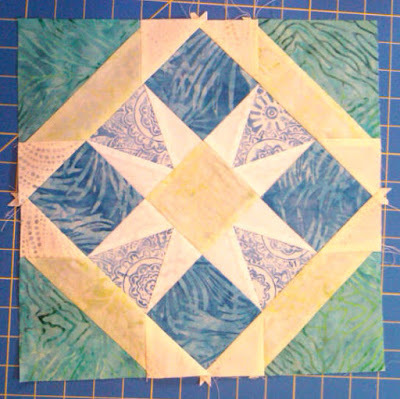 Adjusting my seam allowance did the trick, and now I have completed the first 13 units of this part of the block. The original quilt design requires 13 Block Y units; since I'm enlarging the design to fit my queen size bed, I'll need to make 12 more of this block. To break the project down into manageable sections, I'm working on the first 13 now, then I plan to work on the first 12 Block Z units. I'll go back and work on the second 12 blocks for each later. 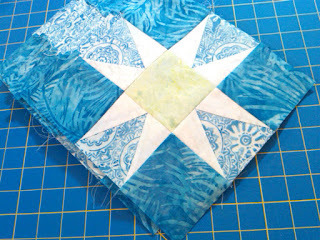 The next step for this block is to add on the corners. My first attempt turned out wonky (sorry no photo) then I realized I assembled it out of order. After ripping the corner unit apart and sewing it in the proper sequence, it turned out fine. Here's my first completely finished Block Y! 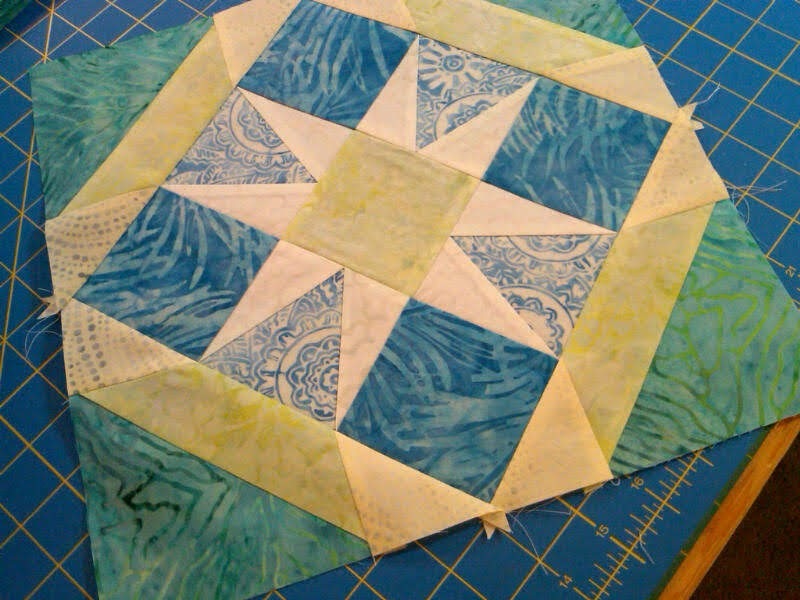 It still needs to be trimmed and squared up, but at least it's the correct size. The blue and white triangle sections are the units that were paper-pieced; all the other pieces were cut cut in strips and then re-cut into squares and triangles before sewing them together. I'm quite pleased that most of my seams and intersections meet pretty much as intended. I think I should point out that I do not consider myself an experienced quilter, so the terminology I use in this series of posts may not be quite accurate. I'm still learning as I go along. Today's project will be to finish the other 12 Y blocks and if I finish those, I'll begin cutting out the pieces for Block Z for the next update.